Decoy construction was as varied as the great variety of men who made them. The end result was the product of many factors that included the carver's line of trade, his knowledge of the species, where he lived, his choice of material, his skill as a carver, and finally his temperament. Was his carving to be strictly utilitarian or did he search out the "essence" of the bird as it took form in his hands? Decoy carving is probably the earliest example of American Folk Art. While form was defined by function, the spirit of the carver defined the spirit of the bird. 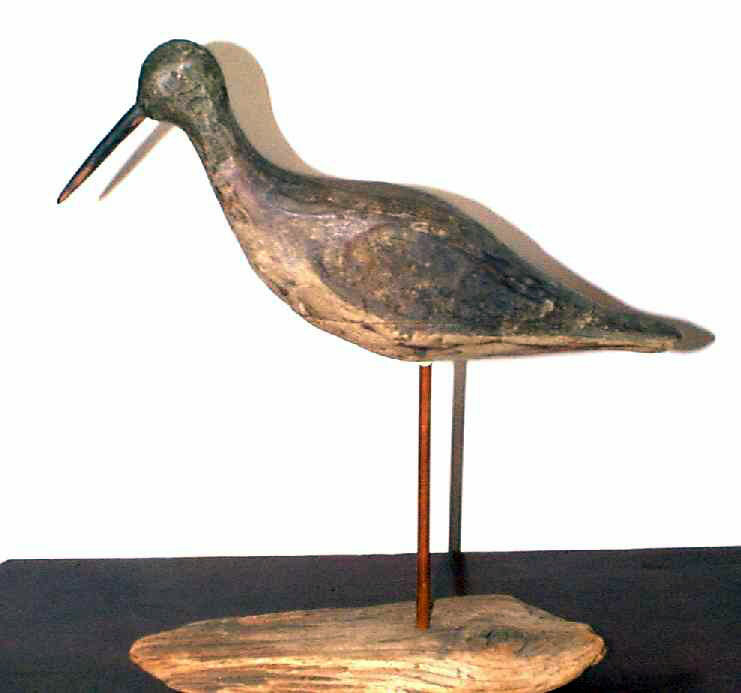 In the early part of the 20th Century, after legislation that restricted hunting practices and outlawed all shorebird shooting was passed, most of the old carvings were thrown away. Fortunately this is one bird that was saved from the driftwood fire on the beach. Roughly carved so the knife marks simulate feathers, even the loss of most of the original paint does not keep us from recognizing the plumage pattern and coloration. This is a wonderful working 19th Century shorebird decoy that has been shot over and bears the scars to prove it. It is structurally sound, of two piece construction with a dry original surface, and a fine example of the decoy carver's art. Unembellished by any fancy wing carving or paint patterns (now), the bird simply "is" and projects it's serenity and gracefulness to anyone who will listen. As with any form of art, it should speak to us. For those who can look past the scars of the past, this little shorebird is a worthwhile addition to any Folk Art Collection. Size is 13" long and @ 13-1/2" tall on the stand.